Many articles have been written on Colour Cosmetics. I too have written a few articles on Colour Cosmetics. A M. Tech. student of mine from ICT (formally UDCT of Mumbai University) called me to ask me to send him a write up on Colour Science and its impact on colour cosmetics; which prompted me to write this article which is an amalgam of Basics of colours, science behind colour and its usage in Cosmetics. Let me begin with basic colour physics. Let us first understand what is colour? The sensation of color is evoked by the physical stimulation of light-sensitive elements in the human retina. The stimulation consists of electromagnetic radiation in the visible spectrum comprising wavelengths between 380 and 780 nm. To see a colour we need a) a Light source b) an object and c) an observer An object has to be illuminated. Light source is an illuminant. It could be a) Day light b) Tungsten light c) Flourescent light. Object selectively absorbs certain wavelength and reflects other. The luminocity of an object is related to sensitivity of human eye. Visual system need colour to find people’s skin, to tell which food is edible, to check whether a person’s appearance looks normal/healthy or for artistic appreciation of an object. 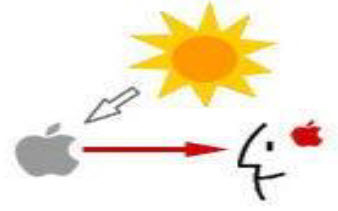 Eye has specific light-sensitive elements, known as cones, which can be separated into three classes, each class being sensitive to a different spectral distribution of radiation. Retina contains three types of receptors (red, blue and green). Humans are tri chromats where as mammals are dichromats. Many different spectral distributions can produce the same perceived color. Physically, different spectral distributions producing same color sensation is called Metamerism. Metamerism is fundamental to the science of color measurement. Color is light, and light is composed of many colors— those we see are the colors of the visual spectrum: red, orange, yellow, green, blue, and violet. Objects absorb certain wavelengths and reflect others back to the viewer. We perceive these wavelengths as color. Chroma, intensity, saturation and luminance/value are inter-related terms and have to do with the description of a color. Chroma =Purity, Saturation=degree of purity, Intensity =Brightness or dullness, Value /Luminance = amount of light reflected. COLOR is a phenomenon of perception not an objective component or characteristic of a substance. Color is an aspect of vision; it is a psychophysical response consisting of a) the physical reaction of the eye, b) automatic interpretive response of the brain to wavelength characteristics of light. Different people can also see color differently. 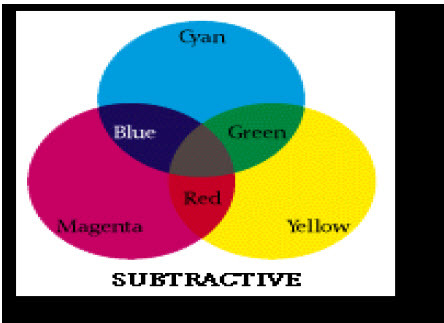 There are two types of colour synthesis A) additive colour synthesis, B)subtractive colour synthesis. 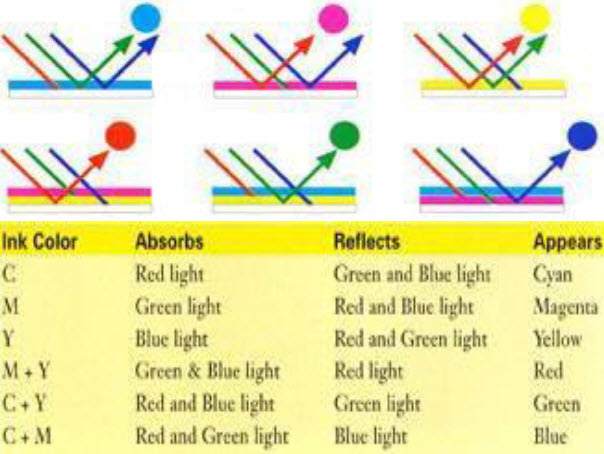 There are two ways of perceiving colour by human eye by reflected light by an opaque object or transmitted light through a medium. In both ways entire spectrum of light minus wavelength of particular light is perceived by eye and colour impression is made in the brain. This is called subtractive colour system. Subtractive color mixing means that one begins with white and ends with black; as one adds color, the result gets darker and tends to black. 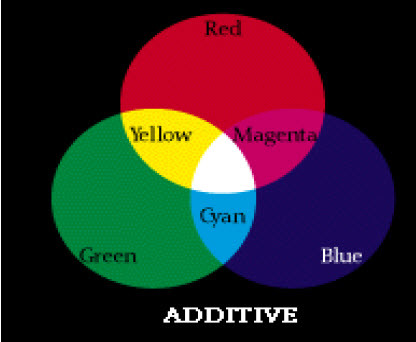 Basic colours are cyan , Magenta and Yellow. Additive Colour system: Electronic color displayed on television and computer is single wavelength colours are additive colours. In this case when these individual colours are added it creates white light. In this case primary colours are red, blue and green. Subtractive colour system or CMYK is actually that we see in nature. The combinations possible are limited. Painters, printers, use a white base and go on mixing these opaque colours and match required shade. In electronic colour possibilities are innumerable in fact we can produce 1.6 crore distinct colours. What we see on a television/computer screen are metameric colours and all these can not be naturally printed.